It’s September and here in Ottawa we are shifting into fall. Big time. With dropping temperatures, cool nights, and rainy, windy days. And I have been shifting gears as well. Not like in the old days of lesson prepping and shopping for back to school outfits. More like shopping for not going back to school outfits. And that, my friends, is way more fun. I’ve always loved the shift into fall. The feeling of getting back to work, or back to school, or just back to real life. And back into boots and sweaters and jackets. These are some of the images that are inspiring me this fall. I didn’t use them to help plan my shopping, but to help me rethink what I already own. Well, except for that Armani outfit in the middle. It’s lovely isn’t it? But would require purchasing three pieces and starting a whole new colour palate, so I’ll restrain myself, and just admire and covet. Yep, today I have tweed coats and jackets, and mohair sweaters, and loafers and brogues on my mind. And lovely browns, and greens, and burgundies. I know that red is big this year. I love the Max Mara ad from Vogue, below. But the colour red is not kind to me; it plays up the ruddy patches in my complexion. Now, a cool burgundy, that’s a whole other story. Burgundy I can do. And a burgundy sweater will perfectly fill a niche in my fall wardrobe. 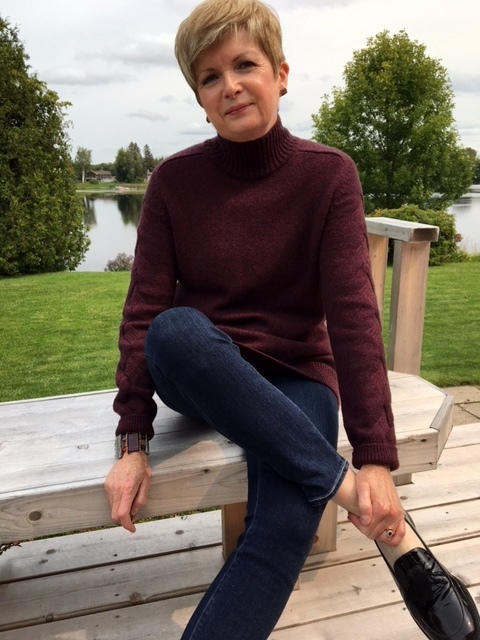 I must say that I’ve been looking for the perfect burgundy sweater ever since I borrowed my friend’s hand-knit, burgundy mohair sweater back in the eighties. I wore it with jeans and low-heeled burgundy boots… and felt wonderful. And… man oh man, I hated to give that sweater back. But I did, and I’ve been looking for one like it ever since. I even toyed with the idea of knitting one last year, but could not find a pattern I liked. Besides, it takes me forever to finish a knitting project. And when I announced to Hubby that I was off to find a pattern and yarn to knit myself a new sweater, he suggested I might prefer a shawl, or something suitable to wear in “the home.” Because that’s where I’d be by the time I finished it. Har-dy-har-har. He thinks he’s funny. So off I went last week on the hunt for a burgundy turtleneck, or a loose burgundy sweater that I could wear under my Max Mara coat. With jeans and loafers, or with black pants and my Stuart Weitzman ankle boots. A sweater that would flatter my colouring, and which when I pulled it on would make me feel great. And sigh with fashion satisfaction. I tried three or four stores before I found this sweater at Nordstrom. It’s by Akris and thus cost more than I had intended to pay. But when I slipped it on, I sighed. It was exactly what I was looking for. The sweater is perfect with jeans and loafers. Slim cut, simple in style, it has a mock turtleneck, and cable stitch down the arms. 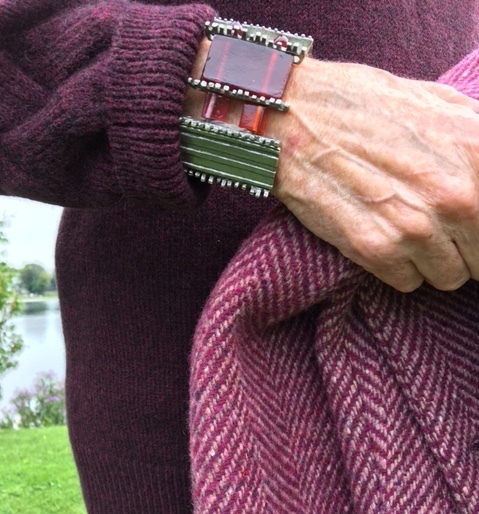 And looks great with my Max Mara tweed coat, and my Anne Marie Chagnon bracelet. I like the sweater with my black Vince leggings, as well as my jeans. And with my black Stuart Weitzman ankle boots, as well as loafers. Later in the season, I’m sure that this sweater and coat combination will be on constant repeat. 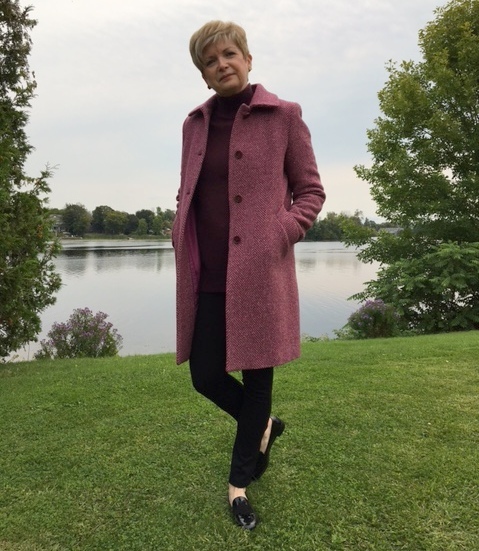 I know that a tweed coat and a simple sweater, with jeans or leggings, and loafers or boots is not an adventurously fashion forward look. But it’s a classic look that I have always loved for fall. So I’m well pleased with myself for snapping up this sweater when I found it. As I said, this sweater fills an empty niche in my wardrobe. 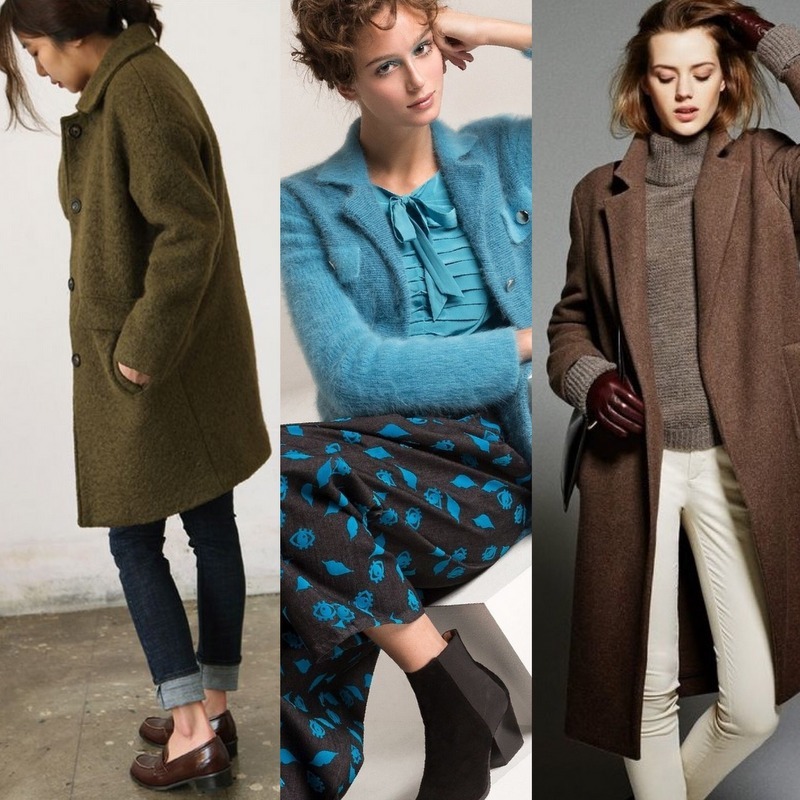 Most of my winter sweaters are camel, or grey, and none of them go with my Max Mara tweed coat. I love the coat with a crisp white shirt, and a scarf, but by November that combination will be too chilly. My new turtleneck will allow me to wear the coat in colder weather without adding layers. This shopping for one piece at a time is a change for me. In fact, being retired has gradually changed my wardrobe planning process over the years. Back when I still worked, I assiduously did my closet inventory, and made a list of what I owned and would still wear this season, and what I might consign or pack away for a few seasons. Then I looked at fashion mags and on-line for trends, and made a list of what I wanted to add to my wardrobe. Then I did a big shop. I’d often buy two whole outfits: pants with a matching jacket and top, maybe a suit, or a sweater and skirt outfit, possibly new boots or shoes. And a couple of filler pieces to pull the new stuff together with the old. If I were looking for a new winter coat and boots, the rest of the list would be pared down. I always called time-out during the shopping to sit and mull over my costs. When I shopped with Liz at Holt Renfrew she’d leave me alone with my choices to do what I called my “subtotal.” I’d add up how much everything cost, and which pieces I should take out of the mix because I’d gone over my budget. My “budget” was never a hard and fast number, just a feel for how much was too much. I often left items behind in the dressing room when I went home. Sometimes reluctantly. Now I still do my inventory, although my closet is much more pared down and it’s easier to remember what I own. I don’t need to worry about five days a week of business wear, plus casual clothes. And I am increasingly finding myself niche shopping. Looking for one or two pieces that will work with something specific. Adding one, or sometimes two, major investment pieces a season. Last year my biggest investment piece for fall was my Veronica Beard suit. Although I bought it in July, and it is supposed to be a spring suit, I wore it long into the autumn. And then a couple of months later, in New York, I bought my Max Mara tweed coat. I bought a few other items but those two were the biggies. In a recent post a reader asked me how I could be so restrained about shopping. But I don’t think of myself as restrained. Just careful. Maybe that comes from growing up in a single parent family with four kids and a tight budget. Mum always managed to buy us what we wanted… but we had to make choices. We couldn’t have everything we wanted, and had to choose only one, or at most two, new back-to-school outfits when we went cross-border shopping while visiting my grandmother. Ha. Now that was a back-to-school tradition. Smuggling. To understand that, I think you had to have grown up near an international border where kids clothes “across the lines” (as we called it) were so very much cheaper. I always chuckle when I think of my grandmother smiling sweetly and calling the border guard by name… “How are things, Harold?”… and us kids sitting on our new clothes in the backseat. Looking like butter wouldn’t melt in our mouths. Then there was the careful shopping in high school for that special sweater or pair of jeans. Once chosen, we’d put $5.00 down to “lay it away.” Then pay $5.00 a week out of our part-time job money until we had paid off the bill and could take our precious item home. Did local stores have plans like that where you grew up? Better than charge cards, because we really, really wanted that sweater by the time we actually owned it. And took special care of it… since it was paid for by weeks of flipping burgers, or in my case, selling hot-dogs in the canteen at a local arena during international professional wrestling matches. Now, that job was an education. I’ll tell you all about it one day. So based on these early shopping experiences, I guess I am restrained when it comes to impulse buying. Or buying what I don’t need. But I’m not terribly restrained when it comes to price. Especially since I feel that if I’m going to buy only one item, it should be good. And I don’t mind paying for quality. And when something is a quality piece, I will take good care of it to protect my investment. Especially if, like my burgundy turtleneck, it’s something I’ve been searching for. So what about you, folks? Are you ready for shifting into fall? How restrained are you when it comes to fall shopping? Do you make a list before you make your assault on the stores? Or maybe you find it easier to be restrained when shopping on-line? Do tell. P.S. Thinking of everyone affected by the climate (hurricanes, floods, or fires up here in Canada) and wishing them well. And hoping they can get back to worrying about less serious issues (like fall fashion) soon. Love the sweater on you – perfect choice. Love the post just as much. 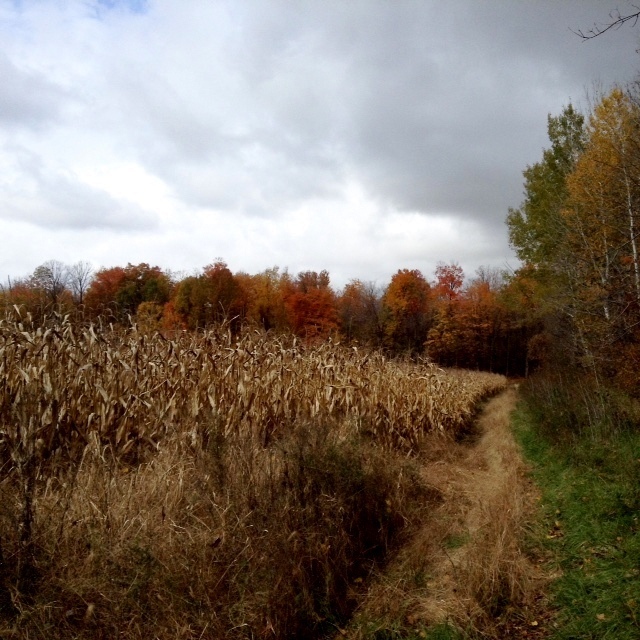 Happy Fall – although i can't believe I'm saying this, can't wait for some cool, crisp fall days and some rain! Ah, thanks. I'd love some sunny crisp days. Hope we get some of those before the rains of November set it. This is the perfect sweater for you. Loved the story about your early years. My mom would put things on layaway and pay each week until we brought our treasure home. She raised my three older brothers in Kentucky during the Depression and frugality was just her way. It was 47 degrees this morning here in the Heartland of America. Brrr.. I've never thought of myself as frugal. But those lessons learned young stay with you, eh? I thought we had the same colouring but I can wear that dull vogue red , perhaps because my rosie cheeks have paled over time . Bright red is still not good . It's difficult to get the true colours on our screens , that burgundy shade is softer in the close up & I could wear that . Either way it suits you & that's a great outfit . I have a jacket in a similar fabric to your coat & have found it tricky to blend into my wardrobe . I'm not seeing anything in the autumn stuff to tempt me yet but that's OK . I enjoy looking . Red, peach, and a kind of dirty white that looks like the underwear tops my grandfather used to wear (I think you'd call them string-vests) all of these colours make me look dreadful. But cool burgundy…I love it on me. A hairdresser I went to years ago taught me that… about cool and warm colours. Thanks, Alayne. I'm happy to have more tops to wear with my tweed coat. Hubby woyld say that we didn't have four seasons this year…. because we didn't have a summer. Just rain, rain, and more rain. Mustn't grumble…at least we didn't have flooding! I love this post so much! First of all, your outfit is smashing! That sweater and coat together demonstrate Synergy — the sum of the two parts far exceeding the sum of their separate effects. . . although both are gorgeous as separate and independent pieces. I never did the instalment-plan approach when I was a teen, although I did save my part-time job money for special items. Much of my wardrobe was bought at what used to be known as "rummage sales" — my mom knew all the best ones in the city, and we'd go far enough afield that we weren't too likely to be seated next to the previous wearer at church. . . . Thanks, Frances. At the time I didn't realize I was practicing delayed gratification when I laid away an item. Just making sure that someone else didn't buy it before I had enough money to pay for it. 'Across the lines'…we said that, too, in Manitoba. Your new sweater is lovely…it's nice to have something that makes us look forward to the colder weather, 'cause it's coming, whether we are looking forward to it or not. Sigh. Did you say that too? I thought it was just a Maritime expression. Might as well make sure we have something great to wear when the cold weather comes, eh? Coping skills. Thanks, Iris. Happy you are liking the more recent Peter Robinson books! They are better than the early ones. Good find, Susan… and man, the season weather change up there doesn't muck around much, by heck ! By heck, I think you're right! Great sweater! How I wish I could wear wool. Every fall and winter I drool over the beautiful wools and envy those of you who don't itch. I can get away with cashmere for a few hours before I want to tear my skin off. Alas. We used the Sears catalog a lot in my very young years, as we didn't live near any big stores. But as we got older, I saved my babysitting and car hopping (A&W Root Beer!) money for our annual late summer trip to Duluth, Minnesota, our closest city and home of my mother's doctor. I had a field day choosing a few special things that I just knew no one else had. But I had to choose, too, because my savings only went so far, of course. My favorite store at the time was Target (in their early days) because they carried trends that I could afford on my summer savings. No trip was anticipated more. Cool here too. I switched out a lot of my clothes today and took a big bag to the charity shop near me. I am trying to be more serious about getting rid of things I just don't wear. Not working anymore there are just things I love but have to admit haven't been on my frame for at least two years. So I guess it's time to stop switching them into the closet seasonally. Sigh. Thanks, Laurel. I have trouble with anything mohair, unless I've a tee or turtleneck under it. I learned that lesson when I bought a gorgeous mohair sweater, put it on one day and my coat over it, and halfway to work I thought I might have to rip the coat off I was so itchy. Love that sweater and coat. I spent an hour today, shopping for a sweater and just looking. Not only did I not find a sweater, I didn't find anything I even wanted. I know how that feels. I've almost given up shopping around widely… so much junk in so many stores, none of which fits me anyway! Love the new sweater, it's a winner! Funny, I too had a boyfriend borrowed burgundy sweater (v-neck, cashmere) that I wore nonstop when I was 18. I've also developed increased sensitivity to wool over time. Though it's always been a challenge to find non-scratchy wool, it's now nearly impossible. But with careful looking (and feeling), I can sometimes find very fine merino that's okay over a a cotton or silk under-layer. And some cashmere sweaters are fine, but then I get too warm. The bigger challenge, though, is that I haven't been able to wear turtlenecks for years and years — it feels like I'm choking. And I have a long neck, which is just perfect for a "turtle"……..oh well, it's also perfect for loosely draped scarves :~). Thanks, Adele. Neither my sister nor my mum can wear tight turtlenecks. My mum always says she feels as if she's smothering in a high neck. I love a tight turtleneck. Always have. Love love your new sweater and the colour! My son is moving to Ottawa and I may visit Liz! She sounds amazing! I remember those days when one would lay $5 down per week. Big laugh at your husbands remark…. You'll have to get in touch and I will pass on her contact details. 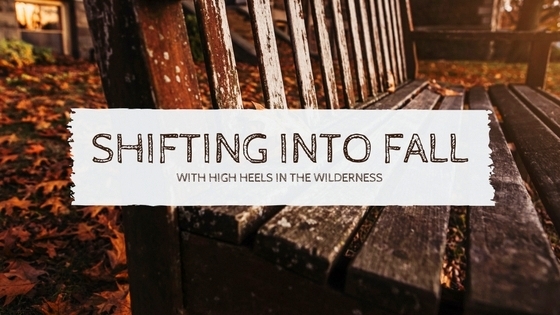 She will be so pleased to see a blog reader…Liz loves High Heels in the Wilderness. Akris and Max Mara… two of my favorites! You always look sensational. Ah, thanks. It's hard to look bad in a Max Mara coat, I must say. I absolutely adore that sweater, both as a piece on its on and how it looks on you. And the color combo of the sweater and that coat, too delicious. This lovely photos (new equipment?) make fall look eligible. Love that sweater and coat combination. I would like to move into autumn, but in Florida it is still hot and now looking forward to Hurricane Irma. Go away Jose! We may not get to wear cool weather clothes (if mine survive) until November. It's always a shock when we go north for Christmas and find it freezing. 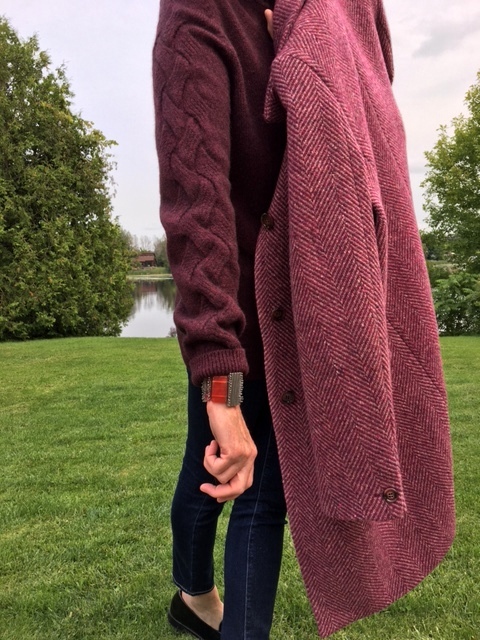 Your burgundy sweater looks so great with the coat and bracelet. I've been buying a lot of stuff for autumn (fall) because I have the added incentive of starting a new job and needing outfits for work, after working mostly at home for years. So I started with inspiration from designers like yours, created a mood board and watched all the fall new arrivals online. It's been fun! That is the best criteria to purchase a garment…when you put it on you sighed! Love that and the look with the coat is autumn perfect! This sweater is lovely. I can see why you sighed when you tried it on! The sleeve detail is gorgeous. Thanks for linking up with Fabulous Friday, Susan! What a pretty sweater. Your area is seeing Fall before we do down here in NY. Thanks for your nice, wistful blog-comment. The sweater is pretty! Love the combo!